"I use color and pattern to infuse my work with life, energy and vitality." 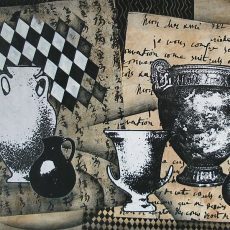 Lisa Kesler's mixed-media works on paper and canvas integrate printmaking, collage and painting. She is intrigued by the possibilities of repetition, an interest she attributes to the patchwork quilts and farmland of her childhood. In her art, she stylizes forms into simpler geometric shapes and juxtaposes bold colors in fanciful compositions. Contrasts between light and dark are central to her work. Kesler continually experiments with techniques and materials. Her most recent work draws on traditional relief printmaking techniques, including linoleum block and wood block printing. Kesler individually paints each print using watercolor and acrylic paints.